Those awaiting results of August 2014 Guidance Counselor board exam may find here list of passers, top 10 (topnotchers), top performing school and performance of schools as the Regulation Commission (PRC) and the Board of Guidance and Counseling released results in 3 working days after the exam. PRC gave licensure exam on Tuesday and Wednesday, August 5-6, 2014 in the city of Manila. The two-day exam covers the following subjects: counseling theories, tools and techniques, career guidance, foundations of guidance (philosophical, psychological and sociological), group process, psychological testing, organization, administration and supervision of guidance services and program development. 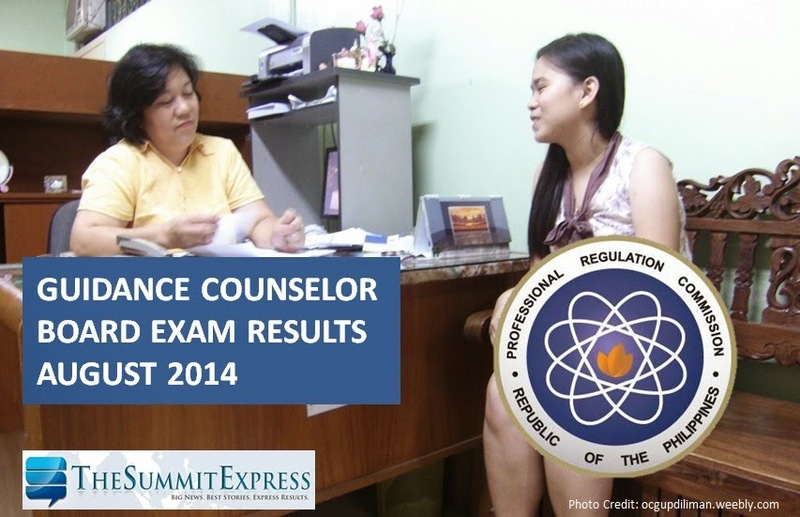 In August 2013, PRC announced that 169 out of 411 passed the Guidance Counselor board exam. A graduate of Saint Joseph's College of Quezon City topped the board with 85.50 average grade. Like Us on Facebook, Follow Us on Twitter to receive more updates about Guidance Counselor licensure examinations. You may also subscribe to our RSS Feeds or via E-Mail.